In the early years of my research, I visited a few microbreweries. I wanted to talk to professional brewers who made ale in the traditional way using crushed malt, not malt extract, and who worked on a small scale. This approach to brewing beer in small batches, supplying local pubs, hotels and restaurants, began to take off in the 1980s and 1990s. The interest in real ale in Britain began with CAMRA in 1971. Peter Brown does a good job in telling the story of the rise of craft beer UK style. Worth reading. Anyway, to get back to my story, one of the microbreweries I visited was a tiny establishment, equipped with one mash tun, one boiler and two fermenters. He used crushed malted barley, hops, water and yeast and made a wide variety of beers from these basic ingredients. As any good brewer does. He was interested in the story of the Bronze Age woman buried in a stone cist at North Mains, Strathallan. She had been buried with a Food Vessel. The residue from a cereal based alcoholic brew, flavoured with meadowsweet, was discovered within it (see part one). We chatted about it in detail, and with some excitement, because I had only just found out about the residue analysis in the Strathallan pot myself. That evening, he went down to the pub and related the story to his mates. And why not? It's a good story. One of his mates was a journalist for the local paper. A couple of days later there was a headline "Bronze Age Barmaid" or "Prehistoric Barmaid discovered" or something along those lines. And my name was attached to it, almost as if I had discovered it. Many of the details were wrong. It was only a small piece in a local newspaper, but it seemed like sensational stuff at the time. Some folk at the University were not very pleased about it. I had just had my first encounter with The Press, and with some of the silliness that seems to surround any news story about ancient alcoholic brews - beer, wine or mead. Maybe that journalist was thinking along the right lines, although 'barmaid' is not quite the right word to use in a prehistoric context. There is a well established tradition of women as cup bearers, providing the drink at feasts. Eva Koch, writing in 1986, gives several archaeological and historical examples of the woman as hostess, who would have held a high status position within society. In her article the woman with the drink she describes the grave at Juellinge of a woman, in her 30s, who was buried wearing her silver jewellery and hair ornaments. In the grave with her was some meat, either a whole sheep or pieces of pork and beef - archaeological sources vary. The bronze bucket had contained a drink brewed with barley and cranberries or crowberries and bog myrtle. There were drinking horns and glasses for her guests. The grave was excavated in 1909. A recent detailed analysis of these residues has led to the novel idea that the Juellinge vessel had contained 'nordic grog'. The media loved this story. There are variations of it all over the internet, but journalists don't always get all the details right. I don't agree with the concept of a 'nordic grog'. I think it is far more likely that the bucket contained an ale, or perhaps you could call it a barley wine, made from wort and flavoured with a few berries, flowers, herbs and maybe some honey. All the sugars that you need for fermentation can be obtained from the mash tun, as I explained in earlier posts. There are many similarities between the Juellinge grave and the burial of the young woman, described by some as a dancing woman or priestess, at Egtved. She was buried wearing bronze jewellery and the bucket at her feet contained the remains of an ale or beer, flavoured with berries and perhaps honey. The bucket was made of birch bark and is too big for a drinking vessel. It is more suitable for serving or perhaps it was one of the vessels used in making the ale. One interpretation is that she was buried with ale for the journey into the afterlife, which is certainly possible. I can't help wondering whether she was buried with the tools of her trade - her brewing bucket. And so we move on to Bronze Age Scotland and the cist grave excavated in 1979 - the one that the brewer was so interested in. 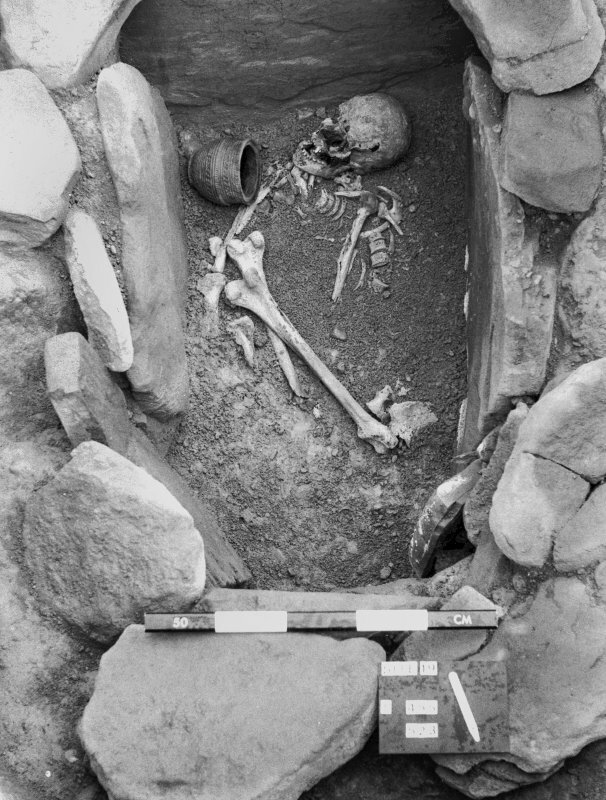 The Bronze Age barmaid herself, buried with her Food Vessel. Could she have been a cup bearer, at feasts and ceremonies, perhaps? Maybe she was an alewife. Some might see her as a priestess or as one of the elite, a high status and important member of society. There are several possible interpretations of who this Bronze Age woman was and what her role in society could have been. The specialist secrets, skills and knowledge of how to transform harvested grain into ale by malting, mashing, lautering, sparging and fermentation were as important then as they are now. Without them, there would be no ale or beer for the feast. I'm sure that the tradition of the alewife, or brewster, goes right back to prehistoric times, to the earliest grain cultivators and processors, the neolithic folk. There are many different herbs and plants that have been used to flavour, preserve or enhance ale. Known today as gruit, some herbs have medicinal or hallucinogenic properties. Henbane pollen was identified in cereal based residues on sherds from large bucket shaped neolithic pottery known as Grooved Ware at a site called Balfarg in Scotland. More on this in the next post. This discovery extends the potential role of the alewife to that of a healer, maybe even more than that. Here's a link to a blog about the 'brewster as witch' by Jane Peyton, a sommelier and beer expert. Her article is a bit of an advert for a Ninkasi style women's brewing competition that took place in 2011. So, sadly, too late for me to make a brew for that. But she makes some interesting points. I shall return to the 'magic of brewing' in a later post. It's a huge topic. Welcome to the wonderful world of prehistoric pottery! It can be quite bewildering. Confusing to non archaeologists, at the very least. I have discovered this after many years of explaining (or trying to explain) prehistoric pottery classifications to tourists. In a British Bronze Age context, there are beakers, collared urns, tripartite food vessels and funerary urns. Simply explained - beakers were drinking vessels. Food Vessels, otherwise known as tripartite food vessels, appear to have had no specific function, other than for 'food preparation'. This is how they are described in the archaeological literature. Sometimes they are found in stone cists and they contained the cremated bone. Collared urns are larger vessels, also often found with cremated bone in burials. This is a blog. It is not an academic thesis. So I must apologise to all archaeological pottery specialists for the simplicity of these descriptions. In March 2012, the land owner of a disused quarry on the island of Arran, off the west coast of Scotland, noticed something interesting in the cliff face. It turned out to be not one, but two Bronze Age stone burial cists. One cist was empty and the other contained the remains of an adult human cremation in a tripartite food vessel and a flint knife. A radiocarbon date of 2154 - 2026 BC was obtained. The flint knife, when analysed, had traces of silica, indicating that it had been used to cut grasses or cereals. This is intriguing. Was this the cist grave of someone, probably a woman, whose work involved the gathering and the processing of wheat or barley? I think so. It's not the sort of thing that is found every day. Excavation techniques involved the use of a cherry picker. A news report with some great photos, is here. The excavation was undertaken by GUARD Archaeology, Glasgow and is available here. In September 2011, in Spinningdale, by the Dornoch Firth in Sutherland, northern Scotland, the accidental discovery of a very well preserved Bronze Age female cist burial, with food vessel, occurred when someone was digging the hole for their new septic tank. Once again, it was excavated by the team at GUARD. Radiocarbon dates from the bone were 2051 -1911 BC and from the charcoal within the grave, dates of 2151-2018 BC were obtained. Inside the cist was female skeleton with a tripartite food vessel at her head. She was between 35 and 50 years old and had been laid upon a sheepskin, or maybe she wore woollen clothing. It is not quite clear, but unusually, fragments of the wool had survived in the well sealed cist. The excavators thought she may have been an important woman, having been buried with such great care and attention. More details here. The cist grave of another high status, important and wealthy Bronze Age woman was recently excavated near Windsor, England. Excavations at the Kingsmead Quarry, undertaken by Wessex Archaeology, were presented to the public in 2013. They have put a lot of their information online. It is a large, complex site that includes mesolithic, neolithic, bronze age, iron age, Romano British and medieval elements. The excavations were generously funded by CEMEX. The archaeologists have been digging up lots of really exciting stuff at Horton and you can read all about it on their web site. Of particular interest is the female burial, dated to between 2500 and 2200 BC. She was at least 35 years old, according to bone evidence. She was buried wearing her necklace of gold, amber and black lignite beads. She may also have had a bracelet, since there were black lignite beads near her wrist. Some perforated amber beads or buttons indicate that she may have worn woolen clothing, with these valuable fasteners. By her side was a large drinking vessel, beaker style. Was this a serving vessel, rather than her personal beaker? It must be considered a possibility. It would be fantastic if a residue analysis could be done of the vessel fabric. I'm not sure, but I don't think this has yet been done. We cannot be completely sure of her full role within society, whether she was a princess, queen, alewife or cup bearer. It is clear that she was a woman of some importance. More details about her here. In the words of the site director, Gareth Chaffey, who has been excavating the site for seven years, " It is interesting to think who this woman was within her community. She was probably an important person in her society, perhaps holding some standing which gave her access to prestigious, rare and exotic items. She could have been a leader, a person with power and authority or possibly part of an elite family - perhaps a princess or a queen." I shall leave the mysterious high status women of the Bronze Age, for now. I'm sure you will come to your own conclusions about them. The image below might not, at first, seem to have anything to do with prehistoric ale. Or beer even. This is the oak log coffin of the young Bronze Age woman known as the Egtved Girl. She died about 3300 years ago. Her oak coffin was found by a farmer, Peter Platz, within a large grassy burial mound in southern Jutland, Denmark. He called in the archaeologists from the local museum who excavated it in 1921. Recent dendrochronological dating of the oak log coffin reveals that the tree was felled in 1370 BC. The North European Bronze Age is a fascinating place to go and visit online to understand some of the background to the Egtved Girl's world. There is a lot of information out there - for example, this atmospheric short film. And lots of pictures of the things that they made and wore and used - the bronze figurines, the sun chariot, the drinking vessels, the well preserved clothing and even a wooden folding seat. What the archaeologists discovered within the Egtved Girl's oak coffin was quite astonishing ... there was no skeleton, just a few fingernails and some of her teeth, brains and hair remained. Her bones had been destroyed by the acidic conditions. But the clothes and the grave goods of the young woman had survived the millennia virtually intact. She had been buried wearing a woven woolen tunic top, a corded wool skirt and a woven belt with a bronze spiked disc. Bronze bracelets adorned her arms. Most people agree that she was a dancer, maybe even a priestess, and that she was buried in her dancing clothes. A small bronze figurine, doing a back flip and wearing a skirt like that of the Egtved Girl, was found at Grevensvaenge, Zealand, Denmark. It was part of a small Bronze Age hoard that was first reported in 1779. Over the years, several of the figurines have been lost but the little bronze acrobatic dancer is now in the National Museum of Denmark. I first came across reports of the Egtved Girl through reading the bibliography of Eva Koch's article Prehistoric Plant Food of Denmark, published in 1999. Archaeology can be a bit like a detective story. In the days before the internet was everywhere, the bibliography at the end of an academic paper was probably the only lead you had to find the next piece of information. What interested me about this young woman's grave was the discovery and subsequent analysis of cereal based organic residues in a birch bark bucket that had been placed in the log coffin. The reconstruction at the National Museum shows how she was laid upon a cow skin. A bundle of cloth, at her feet, contains the burnt bones of a small child, aged 5 or 6 years old. 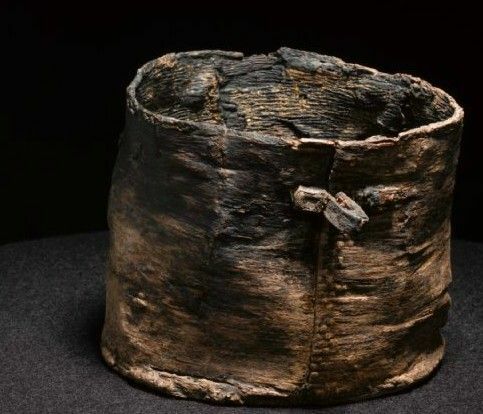 Also at her feet was a bucket made of birch bark. Someone noticed that there was a thick, dark brown residue at the bottom of the bucket. It was analysed in 1929 by Bille Gram. For all you fellow bibliography hunters, this is the reference for the original archaeobotanical report ... over the years I have tried, and failed, to get hold of a copy. In either Danish or English. Maybe you can find it. If you do, please let me know! I don't know how the analysis of the residue was undertaken. I would imagine that it involved a microscope and not a lot else, given that it was done in 1929. The bucket had contained an alcoholic drink - it was probably ale - made from wheat, cowberries or possibly cranberries, bog myrtle, some other plants and perhaps with added honey. Descriptions of the residue analysis vary in the archaeological literature, which is why I would like to read the original archaeobotanical report. Some archaeologists mention the presence of clover pollen, others mention lime flower pollen. Mixed pollens often indicate the addition of honey. It has been suggested in some academic papers that the "beer" was made from the berries, but any all grain brewer knows that this is simply not possible. The primary source of fermentable sugars had to come from the grain - or rather, from grain that had been malted. It could have been either malted wheat or malted barley or a mixture of both. Residue analysis provides you with a list of probable ingredients. It does not provide you with a recipe. Nor will it tell you the ratio of ingredients to each other, nor the quantities that are required. To make a similar brew from the list of ingredients you need a recipe. In other words, you need to know and understand the brewing process, the techniques and the methodology of how to make malt and ale. There seems to be some confusion amongst archaeologists and anthropologists about what malt is, how it is made and how the brewer uses it. Malt is sometimes described as 'toasted barley sprouts' or even as 'sprouted barley' - something like beansprouts. Neither of these is an accurate description. Malt is grain that has been steeped and aerated in water, then spread out on a smooth, level floor within a dark but well ventilated building to begin to germinate. When the acrospire (the root and shoot) is no more than one third the length of the grain, it is dried gently in a kiln. This is traditional floor malting and this process makes pale malt. Specialist malts are made by roasting at higher temperatures. I have read descriptions of brewing in academic papers, explaining that malt is 'boiled with water' to make a 'malt solution' but this would not work at all. The brewer mixes crushed pale malt with hot (not boiling) water to make a sweet wort. This process is called the 'mash' or 'saccharification'. If you boil the malt, then the enzymes that convert starch into sugars are destroyed and you will never make anything fermentable. Specialist dark malts, such as crystal or chocolate malt, are used for colour and flavour and do not provide any sugars in the mash tun. 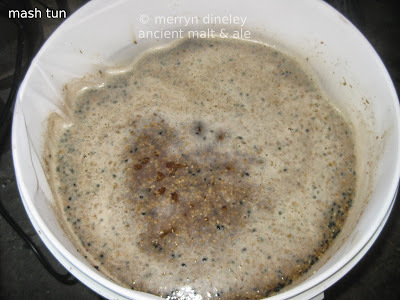 I began to discuss these issues in an an earlier post and I will certainly go back to these fundamental aspects of making malt and ale in future posts. My last academic paper The Craft of the Maltster is about to be published as I write this blog post. I was given permission to put it online. The book of the conference will be out soon. Floor malting techniques have not changed over millennia. wheat - this was probably identified, under the microscope, by the presence of a part of a grain husk. Could it have been a bit of barley husk? This is possible. During the brewing process, specifically in the mash tun, the malted grain is mixed with hot water and the grains become broken up. As mentioned above, whether it was wheat, barley or a mixture of both, the grain had to have been malted. Malt provides the primary fermentable sugars for ale and beer. cowberries - not the main source of fermentable sugars. These are very tart, sharp tasting berries. Probably used as an adjunct. Cowberries, also known as lingonberries were probably identified in the Egtved bucket residue analysis by the presence of seeds. It can be tricky to identify the specific berry type from the seed alone. bog myrtle - also known as myrica gale, this leafy shrub has been used for millennia as a 'brewer's herb'. It both preserves and flavours the ale and it was used before the introduction of hops in medieval times. Many other plants and herbs can be used in brewing ale. We have used meadowsweet and juniper berries in our ancient ales. Yarrow is another commonly used plant as an alternative to hops. These are known as gruit and these days you can buy a wide variety of these ancient and traditional ales in the shops, made by several different brewing companies. lime pollen, clover pollen - the presence of these in the bucket residue might indicate the addition of some honey to the ale. Again, it is an adjunct and not a primary source of sugars for fermentation. Alternatively, the pollen might indicate the addition of lime flowers and clover to the wort, for flavour and/or preservation. We have been making ancient style ales for fifteen years now. Small batches, a few gallons at a time, in our home brewery. To recreate the ale that was in the Egtved bucket we would, first of all, get some malted grain. If possible, we would try to obtain some malted bere - an ancient strain of barley. The grain is skinny, much thinner than modern barley. We have used bere malt successfully to make an ale flavoured and preserved with a few dried meadowsweet flowers instead of hops. We would mash the crushed malt with hot water in the mash tun for about one hour. Grist is the brewer's term for crushed malt. Brewers refer to the water used for brewing as 'liquor'. It is not alcoholic. Then we would lauter, that is, collect the first runnings of sweet wort from the mash tun, and then sparge. This involves running several gallons of hot water through the mash and collecting more wort. As far as quantities and ratios are concerned, we would use about 15 pounds of malted grain to make roughly 8 or 9 gallons of wort. Cowberries could be added to the mash tun, or they could be added to the wort during the boil. It is difficult to know exactly how many to add, but when we made our Juniper Ale with berries, we used just a few ounces to twelve pounds of crushed malt. Having obtained the wort we would boil it, together with some sprigs of bog myrtle and/or lime flowers and clover flowers. Yeast would be added, most likely in the form of barm from a previous brew. Leave the ale to ferment for a few days, then rack it off into a fresh container and see what it tastes like. Over the last few years, there have been some rather strange re-creations of the alcoholic drink hinted at by the residues in the birch bark bucket found at Egtved. Not all of them are convincing. I watched a TV programme recently that showed the archaeologist Neil Oliver drinking an 'ancient style brew'. I think, but am not entirely sure, that it was supposed to be based upon the Egtved residues but, sadly, some of the basic ingredients had been altered. Apple juice was used instead of wort. The herbs, honey and berries were included. I don't think that apple juice would have been an option for those Bronze Age brewers 3300 years ago. Crabapples were the only available 'apple' and these are very sour. Even today, when people make a crabapple wine, they have to add a large quantity of sugar because the crabapples are not sweet enough to ferment by themselves. Crabapples also require a modern press to extract the juice. I cannot work out how the juice could have been pressed from crabapples in Bronze Age Denmark. Another strange brew is Kvasir, made recently by the Dogfish Head Brewery in collaboration with Professor Pat McGovern, who is sometimes referred to as the Beer Archaeologist. For some reason, concentrated birch syrup was included in the Egtved inspired brew. I have no idea why, since this ingredient was not identified in the analysis of the residue from the birch bark bucket. Concentrated birch syrup is made using modern processing techniques. I think the word to remember here is 'inspired'. I don't think they were aiming to actually recreate an accurate copy of the 3300 year old ale, rather, they are making a modern Craft Beer, USA style, that pays homage to the Egtved Girl. I have found no mention of malt, mash tun or wort in the media coverage of this brew. It is odd that she is referred to as a 'leather clad priestess' when she was actually wearing a tunic made from woven wool and a corded skirt. This is a very well known detail of the Egtved Girl's clothing. When she was first discovered, in 1921, some archaeologists thought that there must have been a linen undergarment because the 'string skirt' was so revealing. There are plans to make a commercial beer to a similar recipe in Sweden - Arketyp. This brew appears to have crushed pale malt as an ingredient, but it also includes concentrated birch syrup. Again, I don't understand the reason for this addition to the ale unless it is to make a kind of 'Nordic Grog'. Professor McGovern has proposed, in a recent academic paper, that this is what people made and drank throughout Europe in prehistory - some kind of mixed alcoholic drink made up of different components, such as birch syrup, wine and herbs. Although the biochemical analysis of four residues is incredibly detailed, there is nothing in the paper about malting, mashing, malt sugars or the brewing process. For some of these strange and exotic brews, it seems as if the archaeologists who try to recreate them are struggling to find fermentable sugars, while neglecting the malt and the wort. Barley, and wheat, are an excellent source of sugars for fermentation if processed in the right way. Maybe you have to be a brewer to understand these processes. 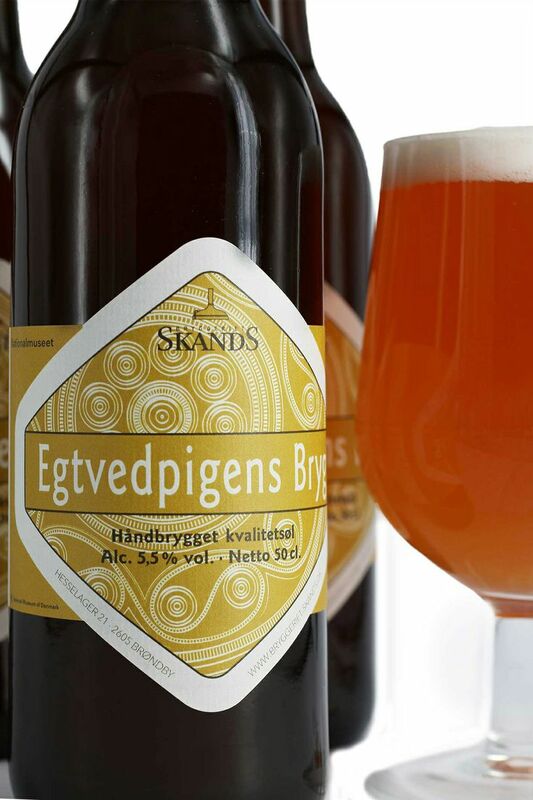 I am very pleased to say that the National Museum of Denmark, working together with the Skands Brewery, have made an authentic ale based upon the ingredients identified in the bucket residue analysis. It should be available in the Museum Shop. If you are lucky enough to go and visit the Egtved Girl in Denmark, maybe you could try some. The details of this ale are, as yet, sparse on the internet. The launch party was on the 22nd of March 2014, so this really is the most recent and, for me, the most exciting development in the long story of the Egtved Girl and her bucket of ale. I have found some Press Releases online, in Danish and translated into English. I expect that we will be hearing a lot more about it in the future.